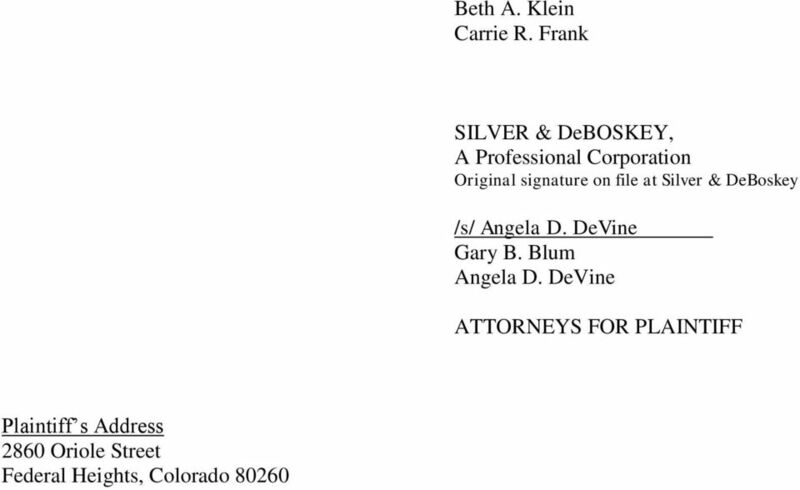 Download "DISTRICT COURT, CITY AND COUNTY OF DENVER, STATE OF COLORADO Court Address: 1437 Bannock Street Denver, Colorado 80202"
2 Plaintiff, R.Z., by and through Cary Smith, as parent and next friend, by her attorneys, for her Amended Complaint against Defendants Rocky Mountain Planned Parenthood Inc. d/b/a Planned Parenthood of the Rocky Mountains, Inc. and Jane Does 1-4, alleges as follows: SUMMARY OF THE CASE 1. This case seeks economic and non-economic damages arising from the Defendants multiple failures to inquire about how a thirteen-year-old girl became pregnant, or what her relationship was to the adult man who brought her to Defendants for an abortion, despite numerous opportunities to speak to the girl alone; their failures to report known or suspected sexual abuse despite numerous indications that the man had sexually abused the girl; and administration of a long-term and undetectable form of birth control to the girl despite her fear of needles, all of which enabled the man to continue his years of sexual abuse of the girl without discovery or consequence. PARTIES 2. Plaintiff R.Z., a minor child, is a resident of the State of Colorado living with her mother, Cary Smith, at 2860 Oriole St., Federal Heights, Colorado 80260, in Adams County. 3. Cary Smith ( Plaintiff ) is a resident of the State of Colorado, residing with her daughter, R.Z., at 2860 Oriole St., Federal Heights, Colorado 80260, in Adams County. Plaintiff brings this action on behalf of her minor child, R.Z. 4. 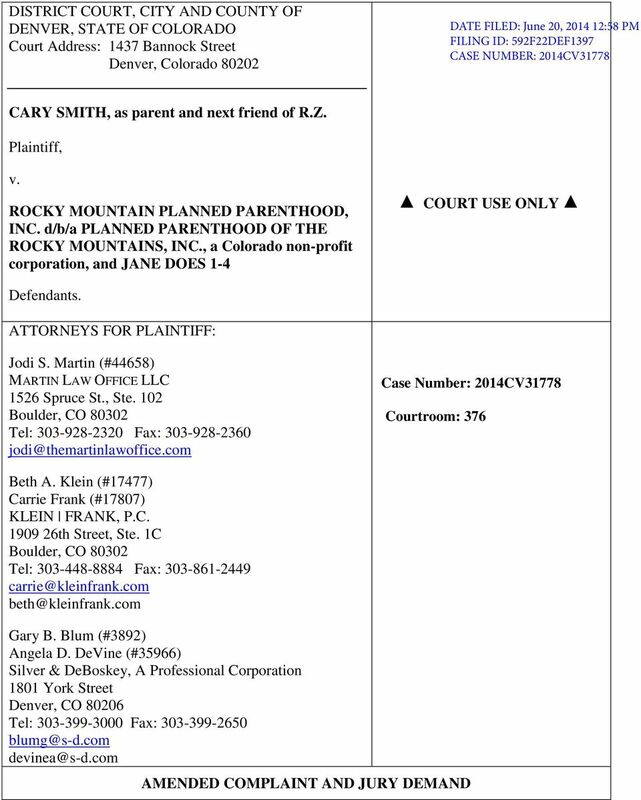 Defendant Rocky Mountain Planned Parenthood, Inc. d/b/a Planned Parenthood of the Rocky Mountains, Inc. ( Planned Parenthood ) is a Colorado non-profit corporation with its principal office located at 7155 East 38th Avenue, Denver, Colorado in the City and County of Denver. 5. 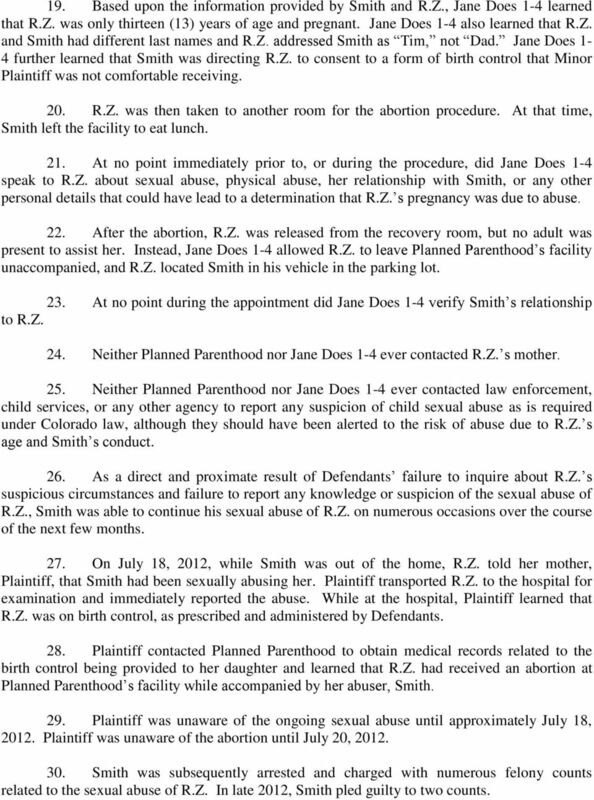 Defendants Jane Does 1-4 are administrative and professional employees of Planned Parenthood who interacted and communicated with R.Z. on May 3, JURISDICTION AND VENUE 6. Plaintiff hereby incorporates all allegations made elsewhere in the Amended Complaint, by 7. Venue for this proceeding is proper in the City and County of Denver pursuant to C.R.C.P. Rule 98(c). 8. Jurisdiction is proper because R.Z. is a resident of the State of Colorado, Planned Parenthood is a Colorado non-profit corporation, with its principal place of business in the State of Colorado, and the events at issue occurred in the State of Colorado. Upon information and belief, Defendants Jane Does 1-4 are also residents of the State of Colorado. 3 FACTUAL ALLEGATIONS 9. Plaintiff hereby incorporates all allegations made elsewhere in the Amended Complaint, by 10. On May 3, 2012, R.Z. was thirteen (13) years of age and had been the victim of sexual abuse by her step-father, Timothy David Smith ( Smith ) for approximately seven (7) years. 11. During the many years of sexual abuse prior to May 3, 2012, Smith had also been verbally and physically abusive to R.Z., including threatening her life, as well as verbally and physically abusive to R.Z. s mother, Plaintiff, in the presence of R.Z. 12. Approximately three weeks prior to May 3, 2012, R.Z. took a pregnancy test at the direction of Smith, due to concerns that she might be pregnant. The test indicated that R.Z. was pregnant. 13. A few days to a week before May 3, 2012, Smith pressured R.Z. to call Planned Parenthood to make an appointment for an abortion. The appointment for an abortion was scheduled for May 3, 2012 at Planned Parenthood s 7155 East 38th Avenue, Denver, Colorado 80207, location. 14. On May 3, 2012, Smith transported R.Z. to Planned Parenthood s facility located at 7155 East 38th Avenue, Denver, Colorado for her appointment and accompanied her inside the facility. 15. In connection with the abortion, Planned Parenthood required certain forms to be completed. Although R.Z. wrote her date of birth and signed some of the forms, the majority of the forms were completed by Smith, and R.Z. did not read them. 16. Smith indicated on the forms that he was R.Z. s father. However, upon information and belief, Jane Does 1-4 heard R.Z. address Smith as Tim, not Dad. 17. R.Z. was briefly examined outside the presence of Smith and then returned to the waiting room where Smith was located. During the examination, none of Jane Does 1-4 spoke to R.Z. about sexual abuse, physical abuse, her relationship with Smith, or any other personal details that could have lead to a determination that R.Z. s pregnancy was due to abuse. 18. During the appointment, Jane Does 1-4 spoke to R.Z. and Smith about prescribing birth control for R.Z. Smith directed R.Z. to accept birth control in the form of an injection so that Plaintiff would not discover that R.Z. was on birth control. R.Z. initially refused, as she did not like shots; however, Smith directed R.Z. to agree to the injection. Some or all of Jane Does 1-4 were present for at least a portion of this conversation, but did not question R.Z. regarding the situation or potential sexual abuse. 4 19. Based upon the information provided by Smith and R.Z., Jane Does 1-4 learned that R.Z. was only thirteen (13) years of age and pregnant. Jane Does 1-4 also learned that R.Z. and Smith had different last names and R.Z. addressed Smith as Tim, not Dad. Jane Does 1-4 further learned that Smith was directing R.Z. to consent to a form of birth control that Minor Plaintiff was not comfortable receiving. 20. R.Z. was then taken to another room for the abortion procedure. At that time, Smith left the facility to eat lunch. 21. At no point immediately prior to, or during the procedure, did Jane Does 1-4 speak to R.Z. about sexual abuse, physical abuse, her relationship with Smith, or any other personal details that could have lead to a determination that R.Z. s pregnancy was due to abuse. 22. After the abortion, R.Z. was released from the recovery room, but no adult was present to assist her. Instead, Jane Does 1-4 allowed R.Z. to leave Planned Parenthood s facility unaccompanied, and R.Z. located Smith in his vehicle in the parking lot. 23. At no point during the appointment did Jane Does 1-4 verify Smith s relationship to R.Z. 24. Neither Planned Parenthood nor Jane Does 1-4 ever contacted R.Z. s mother. 25. Neither Planned Parenthood nor Jane Does 1-4 ever contacted law enforcement, child services, or any other agency to report any suspicion of child sexual abuse as is required under Colorado law, although they should have been alerted to the risk of abuse due to R.Z. s age and Smith s conduct. 26. As a direct and proximate result of Defendants failure to inquire about R.Z. s suspicious circumstances and failure to report any knowledge or suspicion of the sexual abuse of R.Z., Smith was able to continue his sexual abuse of R.Z. on numerous occasions over the course of the next few months. 27. On July 18, 2012, while Smith was out of the home, R.Z. told her mother, Plaintiff, that Smith had been sexually abusing her. Plaintiff transported R.Z. to the hospital for examination and immediately reported the abuse. While at the hospital, Plaintiff learned that R.Z. was on birth control, as prescribed and administered by Defendants. 28. Plaintiff contacted Planned Parenthood to obtain medical records related to the birth control being provided to her daughter and learned that R.Z. had received an abortion at Planned Parenthood s facility while accompanied by her abuser, Smith. 29. Plaintiff was unaware of the ongoing sexual abuse until approximately July 18, Plaintiff was unaware of the abortion until July 20, Smith was subsequently arrested and charged with numerous felony counts related to the sexual abuse of R.Z. In late 2012, Smith pled guilty to two counts. 5 FIRST CLAIM FOR RELIEF RESPONDEAT SUPERIOR (Against Planned Parenthood) 31. Plaintiff hereby incorporates all allegations made in the Amended Complaint, by 32. Jane Does 1-4 were employees of Planned Parenthood on May 3, Jane Does 1-4 were acting within the scope of their employment with Planned Parenthood when they interacted and communicated with R.Z. on May 3, Planned Parenthood is a Colorado non-profit corporation that can only act through its employees. As such, any act or omission of an employee while acting within her employment is the act or omission of Planned Parenthood. 35. The acts and omissions of Jane Does 1-4, and therefore also of Planned Parenthood, on May 3, 2012 have caused R.Z. damages in an amount to be proven at trial, plus interests, costs and attorneys fees. SECOND CLAIM FOR RELIEF NEGLIGENCE (Against Planned Parenthood and Jane Does 1-4) 36. Plaintiff hereby incorporates all allegations made in the Amended Complaint, by 37. On May 3, 2012 Defendants had a duty to inquire of R.Z. sufficient to assess whether R.Z. was the victim of sexual abuse. 38. On May 3, 2012, Defendants had sufficient information available to them to provide knowledge or suspicion of sexual abuse of R.Z. 39. A reasonably careful physician or medical provider in Defendants positions would have inquired of R.Z. to determine whether she was the subject of sexual abuse. 40. Defendants failed to sufficiently inquire of R.Z. to evaluate whether R.Z. was the victim of sexual abuse. 41. Defendants failures to inquire of R.Z. were breaches of the duty owed by a reasonably prudent physician or medical provider to R.Z. 42. As a direct and proximate result of Defendants breaches of their duties, R.Z. s sexual abuse remained concealed and R.Z. was placed on birth control, all of which enabled Smith to continue to sexually abuse R.Z. on numerous occasions for more than two additional months. 6 43. As a direct and proximate result of Defendants breaches of their duties, R.Z. has sustained damages in an amount to be proven at trial, plus interest, costs and attorneys fees. 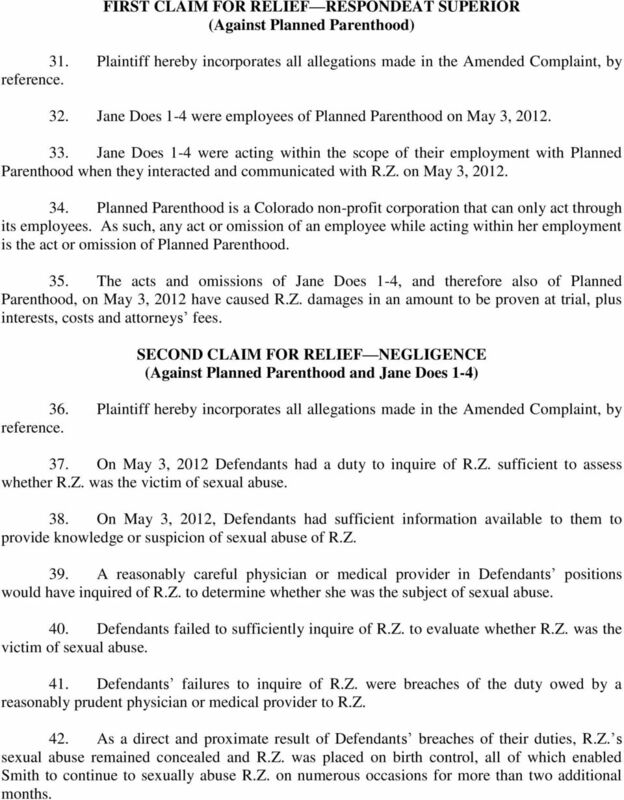 THIRD CLAIM FOR RELIEF NEGLIGENCE PER SE (Against Planned Parenthood and Jane Does 1-4) 44. Plaintiff hereby incorporates all allegations made in the Amended Complaint, by 45. On May 3, 2012, Defendants had a duty under C.R.S to report known or suspected sexual abuse of minors. 46. On May 3, 2012, Defendants had sufficient information available to them to provide knowledge or suspicion of sexual abuse of R.Z. 47. Defendants failed to report known or suspected sexual abuse of R.Z. 48. On May 3, 2012, Defendants had a duty under C.R.S to not perform an abortion on R.Z. until 48 hours after written notice of the pending abortion had been delivered to Plaintiff at her home. 49. Defendants did not provide written notice to Plaintiff of the pending abortion. 50. Defendants did not wait 48 hours to perform an abortion on R.Z. 51. As a direct and proximate result of Defendants breaches of their duties, R.Z. has sustained damages in an amount to be proven at trial, plus interest, costs and attorneys fees. 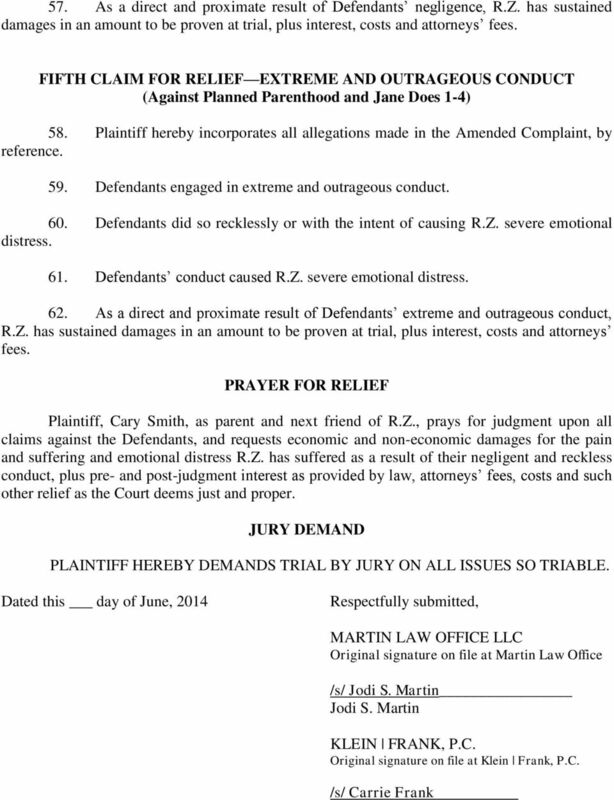 FOURTH CLAIM FOR RELIEF NEGLIGENT INFLICTION OF EMOTIONAL DISTRESS (Against Planned Parenthood and Jane Does 1-4) 52. Plaintiff hereby incorporates all allegations made in the Amended Complaint, by 53. Defendants were negligent in failing to sufficiently inquire of R.Z. to assess whether R.Z. was the victim of sexual abuse. R.Z. 54. Defendants were negligent in failing to report known or suspected sexual abuse of 55. Defendants negligence created an unreasonable risk of physical harm to R.Z. 56. Defendants negligence caused R.Z. to be put in fear for her own safety and such fear was shown by physical consequences or long continued emotional disturbance, rather than only momentary fright, shock, or other similar and immediate emotional distress. Case 3:10-cv-00403-PK Document 1 Filed 04/13/2010 Page 1 of 8 2 FIlED'i0 fffi 1310:57USDC [l1p 3 4 5 6 7 UNITED STATES DISTRICT COURT DISTRICT OF OREGON AT PORTLAND 8 EDWARD J. BYLSMA, an individual, NO. COURT OF APPEALS, STATE OF COLORADO 2 East 14 th Avenue Denver, CO 80203 (Appeal from) COURT USE ONLY DENVER COUNTY DISTRICT COURT COLORADO Denver City and County Building 1437 Bannock St. Judge John W.
IN THE CIRCUIT COURT FOR THE STATE OF OREGON COUNTY OF MARION. Plaintiff, Defendants.